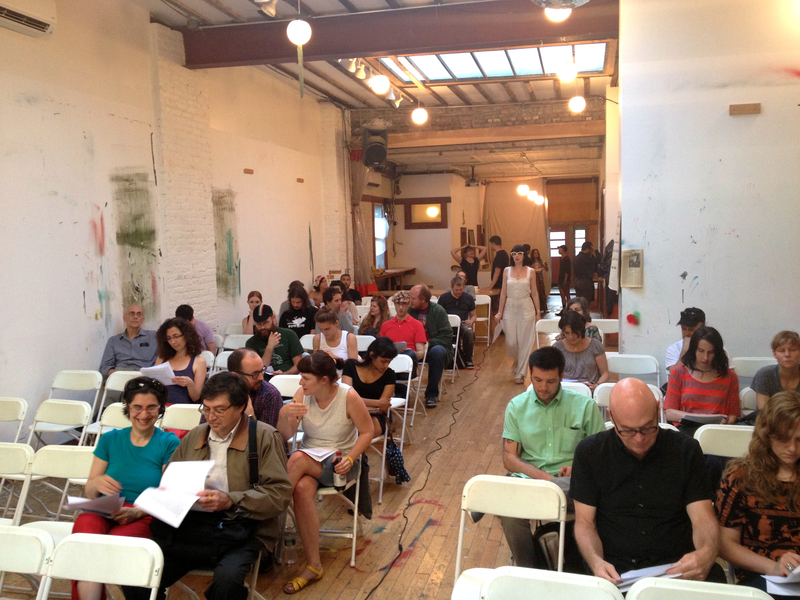 Bushwick Artists: Maybe We Should All Just Buy a Building Together? Six years ago, Josefina Blanc, a former photography editor at Art & Commerce, found herself priced out of Bushwick when the rent on the 10,000 sq. ft. loft shot up from $2,500 to $8,000. Her husband, a performance artist now represented by a gallery in Chelsea, had spent years renovating the space with the understanding that, in exchange, the rent would remain stable, but efforts to appeal to their landlord were in vain. The couple decided to call it quits and moved to South Carolina that year. Though no longer a resident, Blanc decided to drop into Jules de Balincourt’s 5,000 sq. ft. live/work space on Starr Street last night for an impromptu town hall led by Balincourt and his longtime artist friends – Lynn Sullivan and William Powhida – and art blogger Paddy Johnson of Art F City. 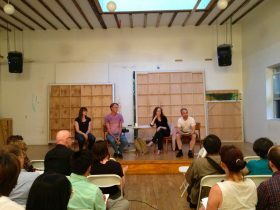 That was one idea for empowering artists who need affordable studio spaces while in the midst of “gentrification on steroids”: team together to buy either a condo or a coop or some kind of collective space that could be run by a trust or as a collective with the backing of developers or through non-profit status. Another (short-term) idea: squatting. The topic came up half-jokingly, but two masters students from Parsons studying Urban Ecology didn’t think it sounded half bad. 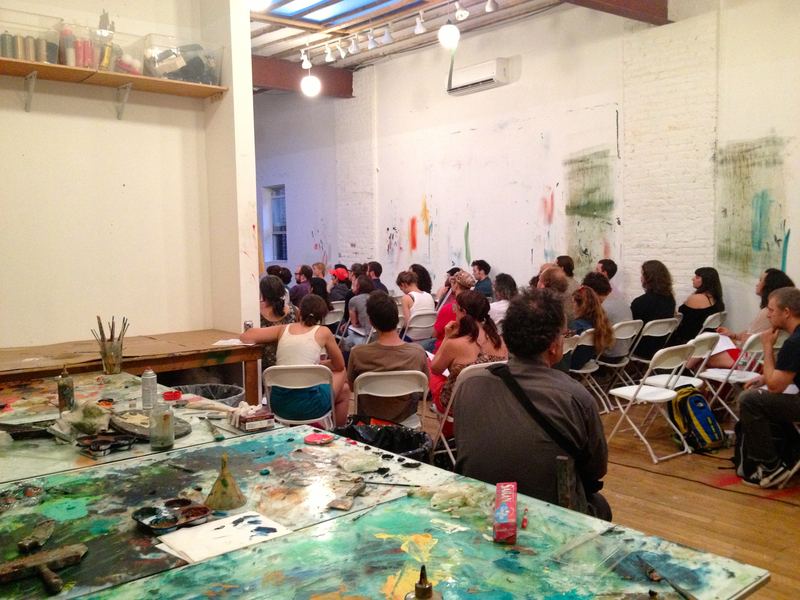 Another local artist mentioned that he bought his space through his landlord – meaning, his landlord financed the deal just as any bank would. The artist gave the landlord roughly $15,000 upfront for a down-payment and pays mortgage on his 800-sq.-ft. garage studio every month directly to an old Sicilian family that bought property outright in Bushwick thirty years ago and that, he said, likes the idea of financing potential owners like him because they don’t want to pay taxes on their loose cash. The only downside: a high interest rate, set during the financial crisis in 2008. 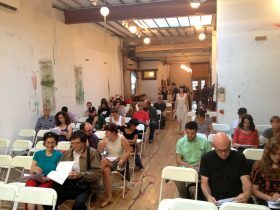 About 80 people – many of them middle-aged – attended last night’s meeting, a good turnout that panelist Powhida attributed to the high tension surrounding real estate in Bushwick. But that wasn’t so clear last night: some people wanted to fight gentrification head-on and simply stay put in their current apartments and studios. Others wanted to join with two or three similarly financed individuals to buy smaller buildings. Another strategy was to form a long-term community: “a wetland for artists of sorts,” as put by panelist Sullivan. For as many good ideas tabled last night, there was an equal match in confusion. People were requesting online documents defining the differences in their options. The few city employees, lawyers, and real estate gurus that were in the room are going to be in high demand in the future. For her part, the lack of unity concerned Blanc. Though not an immediate stakeholder in the community, her nostalgia for New York kicked in at the end, and she suggested they at least form research committees so that they would have more information at the next meeting, even though she wouldn’t be attending.